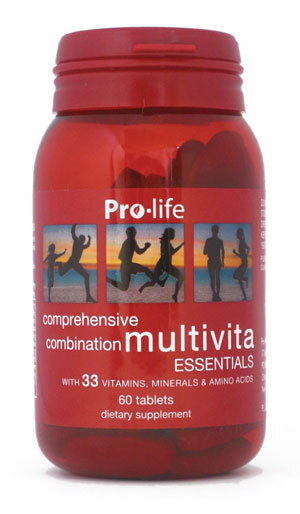 Multivita is a comprehensive formula containing vitamins and minerals essential for daily metabolic needs. These nutrients provide nutritional support for maintaining general well-being and vitality. Adults – Take 1-3 tablets daily, 20 minutes before food, or as professionally recommended. Cautions: Seek professional health advice if pregnant, lactating, suffering from a medical condition, taking medication, or a child before supplementing. Boron (Chelate) 75mcg, Calcium (Chelate) 8mg, Iron (Chelate) 1mg, Magnesium (Chelate) 8mg, Manganese (Chelate) 400mcg, Molybdenum (Chelate) 100mcg, Potassium (Chelate) 5mg, Selenium (Chelate) 30mcg, Silica (Chelate) 500mcg, Vanadium (Chelate) 30mcg, Zinc (Methionine) 4mg, Chromium (Nicotinate) 50mcg, Phosphorus (Chelate) 5mg, Copper (Gluconate) 500mcg, Calcium Ascorbate (Vitamin C) 130mg, Calcium Pantothenate (Vitamin B5) 25mg, Choline Bitartrate 15mg, Inositol 10mg, Nicotinic Acid (Vitamin B3) 10mg, Para Amino Benzoic Acid 10mg, Pyridoxine HCl (Vitamin B6) 15mg, Riboflavin (Vitamin B2) 2mg, Thiamine HCl (Vitamin B1) 5mg, d-alpha Tocopherol Succinate (Vit E) 20iu, Beta Carotene (Provitamin A) 1mg, Folic Acid 40mcg, Cyanocobalamin (Vitamin B12)15mcg, Cholecalciferol (Vitamin D3) 40iu, Phylloquinone (Vitamin K1) 30mcg, Biotin 10mcg, Kelp (containing Iodine)10mg, L-Methionine 20mg, n-acetyl-L-Cysteine 40mg.This product contains tableting aids and coating colour. Use of multivitamin and mineral supplements is common among adults. In Washington DC, US Food and Drug Administration carried out a survey to estimate and identify the trend in the prevalence and magnitude of supplement usage in US. The prevalence of supplement users increased from 42% in 1980 to 57% in 1986. The usage was more likely and more intense among individuals who had one or more health problems and individuals who perceived their health as very good or excellent. The findings indicate that supplement usage remains a widespread behaviour linked to popular conceptions of good health and well-being. Navarro M. and Wood R.J. studied the plasma changes in nutrients following a multivitamin and mineral supplement in healthy adults. The results suggest that supplement can be used as a vehicle to decrease the prevalence of multiple nutrient deficiencies. This is particularly important for older adults to improve their nutrient status to levels associated with reduced risk for several chronic diseases. Trials have been designed to assess the reputed benefits of multivitamin and mineral supplement. A randomized, double-blind, placebo-controlled trial was undertaken to determine the effect of a daily use of multivitamin and mineral supplement on infection and well-being. A total of 130 community-dwelling adults participated in the study in North Carolina. They were stratified by age, either 45 to 64 years or more than 65 years, and presence of type 2 diabetes mellitus. They were given a multivitamin and mineral supplement or placebo daily for 1 year. The incidence of participant-reported symptoms of infection, incidence of infection-associated absenteeism, and scores on the physical and mental health subscales of the Medical Outcomes Study 12-Item Short Form were recorded. More participants receiving placebo reported an infectious illness over the study year than did participants receiving multivitamin and mineral supplement. Infection-related absenteeism was higher in the placebo group than in the supplement group. Among diabetic participants receiving placebo, 93% reported an infection compared with 17% of those receiving supplements. Medical Outcomes Study 12-Item Short Form scores did not differ between the supplement and placebo groups. This study showed that a multivitamin and mineral supplement reduced the incidence of participant-reported infection and related absenteeism in a sample of participants with type 2 diabetes mellitus. The effects of a multivitamin and mineral supplement on psychological well-being were also studied in another double-blind, randomised-control trial. Eighty healthy male volunteers were assigned to either a multivitamin and mineral supplement or placebo daily for 28 days. Questionnaires measuring psychological state were completed and a blood sample taken to determine plasma zinc concentration before and after the trial. At the end of the study, the acceptability of the supplement and participants' awareness of supplement condition were assessed, as was habitual dietary behaviour. The result indicated that multivitamin and mineral supplement was associated with consistent and statistically significant reductions in anxiety and perceived stress compared to placebo. Participants in the supplement group also tended to rate themselves as less tired and better able to concentrate following the supplement. These findings demonstrate that multivitamin and mineral supplement significantly reduces anxiety and perceived stress. These two trials illustrate that a multivitamin and mineral supplement is beneficial for reducing the incidence of infection, improving general well-being, and reducing anxiety and perceived stress. Boron is a non-metallic element present in the diet and in the human body in trace amounts. It is found significantly in raisins, prunes, and nuts, as well as fruits, vegetables and legumes. Boron is distributed throughout the human body with the highest concentration in the bones and dental enamel. It appears to affect the metabolism of calcium, magnesium, copper, phosphorus, and vitamin D. It seems to be essential for healthy bone and joint functions and affect cell membranes. Calcium is the most abundant, essential mineral in the human body. Most dietary calcium comes from dairy products and other good sources include sardines, canned salmon, green leafy vegetables and tofu. 99% of calcium contained in the average body is located in the bones and teeth. Calcium is needed to form bones and teeth and is also required for blood clotting, blood pressure regulation, transmission of signals in nerve cells, and muscle contraction. The importance of calcium for preventing osteoporosis is probably its most well-known role. Iron is an essential mineral that is found in oysters, meat and poultry, fish, dried fruit, molasses, leafy green vegetables, wine, and iron supplements. It is part of hemoglobin, the oxygen-carrying component of the blood. Hence, iron is essential for oxygen transport and storage in the blood and muscle, it is also required for energy production, fatty acid metabolism and maintenance of a healthy immune system. Magnesium is an essential mineral to the human body and is one of the most abundant minerals in soft tissue. Good sources of magnesium include nuts, grains, beans, dark green vegetables, fish and meat. Magnesium is needed for production and transfer of energy, protein and carbohydrate metabolism, manufacture of genetic material and transport of substances across cell membranes. It is vital for healthy heart, bones, muscles and blood vessels. Manganese is found in nuts and seeds, wheat germ, wheat bran, leafy green vegetables, beet tops, tea, and pineapple. It is an essential trace mineral needed for healthy skin, bone, and cartilage formation, as well as glucose tolerance. It helps activate superoxide dismutase (SOD)—an important antioxidant enzyme. Manganese is also required for energy production, protein metabolism and a healthy nervous system. Molybdenum is an essential trace mineral needed for the proper function of certain enzyme-dependent processes, including the metabolism of iron, protein and carbohydrate. It is also essential for alcohol and sulfite detoxification. The best sources of molybdenum are beans, dark green leafy vegetables, and grains. Potassium is found in most fruits, beans, milk and vegetables and is an essential mineral needed to regulate water balance, levels of acidity, blood pressure, and neuromuscular function. It also plays a critical role in the transmission of nerve impulses and electrical impulses in the heart. This mineral is also required for carbohydrate and protein metabolism. Potassium is an important mineral for maintaining a healthy heart and blood vessels. Selenium is an essential trace mineral for human and is concentrated in the kidneys, liver, heart, spleen and testes. It is sourced from brazil nuts, yeast, whole grains and seafood. Selenium activates an antioxidant enzyme called glutathione peroxidase, which may help protect the body from free radical damage to cells. It is also essential for healthy immune and cardiovascular systems, as well as hormone production. Silica (Silicon) is the most abundant mineral in the earth’s crust and is a trace mineral in humans. Good dietary sources for silicon include whole-grain breads and cereals, root vegetables, and beer. This mineral is present in bone, blood vessels, cartilage, tendons, skin and hair. It has been used to improve strength in hair, skin and nails, and to increase bone mineral density. It may also play a role in the formation of cartilage and other connective tissue, giving strength and stability. Vanadium is an ultra-trace mineral found in the human diet and the human body. It is found in a wide variety of foods, including seafood, cereals, mushrooms, parsley, corn, soy and gelatin. Vanadium may act as a cofactor for enzymes involved in blood sugar metabolism, lipid and cholesterol metabolism, bones and tooth development, fertility, thyroid function, hormone production and neurotransmitter metabolism. Zinc is an essential mineral that is found in oysters, meat, eggs, seafood, black-eyed peas, tofu and wheat germ. It is a component of more than 300 enzymes needed to repair wounds, maintain fertility in adults and growth in children, synthesize protein, help cells reproduce, preserve vision, boost immunity, and protect against free radicals. Zinc is vital for maintaining a healthy brain teeth, bones and skin. Chromium is an essential trace mineral that is found in brewer’s yeast, grains and cereals, and some brands of beer. It helps the body maintain normal blood sugar levels because it is part of a compound known as glucose tolerance factor (GTF) which works with insulin to move glucose into cells where it can be used to generate energy. Optimal chromium intake appears to decrease the amount of insulin needed to maintain normal blood sugar. Adequate chromium intake is also essential for maintaining healthy cholesterol levels. Phosphorus is an essential mineral that is usually found in nature combined with oxygen as phosphate. It is sourced from protein-rich foods and cereal grains. Most of the phosphate in the human body is in bone, but phosphate-containing molecules, for example phospholipids, are important components of cell membranes and lipoprotein particles, such as cholesterols. Phosphorus is also required for acid-base balance in the body, energy production and exchange, and metabolism of protein, carbohydrates, fats and DNA. Copper is an essential trace element present in the diet and in the human body. Good sources of copper include oysters, nuts, dried legumes, cereals, potatoes, vegetables and meat. Copper is most concentrated in the brain and liver and is needed to absorb and utilize iron. It is an important component in many enzymes that play vital role in energy production in cells, antioxidant, hormone synthesis and production of skin pigment. Copper is also vital for healthy nervous, cardiovascular and immune systems. Calcium ascorbate (Vitamin C) is a water-soluble vitamin that has a number of biological functions. Acting as an antioxidant, one of vitamin C’s important functions is to protect LDL cholesterol from oxidative damage. Vitamin C is needed to make collagen, a protein that forms the basis of connective tissues such as bones, teeth and cartilage and strengthens many parts of the body, such as muscles and blood vessels. It plays important roles in wound healing and as a natural antihistamine. This vitamin also aids in the formation of liver bile, and helps to fight viruses and to detoxify alcohol and other substances. Vitamin C is essential for maintaining healthy immune and nervous systems. Calcium pantothenate, also known as Vitamin B5, is a water-soluble vitamin involved in the Kreb’s cycle of energy production. It is needed to make the neurotransmitter, such as acetylcholine, which is required for normal nervous system function. It also activates the adrenal glands to produce adrenal hormones that play an essential part in the body’s reaction to stress. Vitamin B5 is also essential for healthy immune system, red blood cells, and cholesterol and fatty acid metabolism. Choline bitartrate has been recently suggested as an essential nutrient in humans. It is a component of cell membranes and participates in many functions involving cellular components called phospholipids. It accelerates the synthesis and release of the neurotransmitter acetylcholine, which is involved in many nerve and brain functions. Choline is also involved in fat metabolism and in the transport of fats from the liver. Inositol is part of the vitamin B-complex. It can be sourced from nuts, beans, wheat and wheat bran, cantaloupe and oranges. Inositol is found in the brain, nerves, muscles, bones, reproductive organs, stomach, kidney, spleen, liver and heart. It is a component of cell membranes and myelin which coats the nerves and therefore affects the nerve transmission. Inositol also helps in transporting fats within the body and control of blood cholesterol. Nicotinic acid, also known as Vitamin B3, is a water-soluble vitamin used by the body in the process of releasing energy from carbohydrates. The best food sources of vitamin B3 are peanuts, brewer’s yeast, fish, and meat. Nicotinic acid is needed for healthy skin, and digestive, brain and nervous systems. It is also involved in regulation of cholesterol, production of red blood cells, hormone synthesis and repair of genetic material. Para amino benzoic acid (PABA) is a member of the vitamin B-complex. It is found in grains and foods of animal origin. It is a compound that is an essential nutrient for micro-organisms and some animals. It has been used as a sunscreen to protect against ultraviolet rays, and to turn grey hair back to its natural colour and to treat vitiligo, a skin depigmenting condition. PABA may be important for skin, hair and intestinal health. Pyridoxine HCl, also known as Vitamin B6, is the master vitamin for processing amino acids, the building blocks of all proteins and some hormones. It aids in the formation of several neurotransmitters and is therefore an essential nutrient in the regulation of mental processes and possibly mood. Like the other B-complex vitamin, vitamin B6 is also involved in the functioning of enzymes involved in the release of energy from food. It is also important for maintaining healthy hair, skin and red blood cells, and normal functioning of cardiovascular, nervous and immune system. Riboflavin (Vitamin B2) is a water-soluble vitamin that is found in dairy products, eggs, meat, leafy green vegetables, whole grains and enriched grains. It is needed to process amino acids and fats, activate vitamin B6 and folic acid, and help convert carbohydrates into ATP, the fuel the body runs on. Vitamin B2 is involved in adrenal gland function and in the production and regulation of certain hormones. It is also vital for healthy brain, immune and nervous systems. Thiamine HCl (Vitamin B1) is a water-soluble vitamin needed to process carbohydrates, fat and protein. Wheat germ, whole wheat, peas, beans, enriched flour, fish, peanuts and meat are all good sources of vitamin B1. Thiamine is part of an enzyme system which is essential for nearly every cellular reaction in the body. It is vital for normal development, growth, reproduction, healthy skin and hair, blood production and immune function. Nerve cells require vitamin B1 in order to function normally as it is necessary for the synthesis of a neurotransmitter, acetylcholine, which affects several brain functions including memory, and also maintains muscle tone of the stomach, intestines and heart. d-Alpha tocopherol succinate (Vitamin E) is an antioxidant that protects cells against free radical damage which may lead to disorders such as heart disease and cancer. It is particularly important in protecting fats, cell membranes, DNA and enzymes against damage. Vitamin E is essential for the maintenance of a healthy immune system and vision. As an antioxidant, vitamin E may also protect against the effects of aging caused by degeneration in tissues such as the skin and blood vessels. Beta carotene (Pro-vitamin A) is a substance from plants, such as dark green and orange-yellow vegetables, that the body converts into vitamin A as the body requires. It acts as an antioxidant and helps to protect the body against heart disease, cancer, eye damage and other disorders. Beta carotene also acts as an immune system booster. Folic acid is a B vitamin needed for cell replication and growth. It is essential for the synthesis of the DNA and RNA, the genetic material of cells. Therefore, rapidly growing tissues, such as those of a foetus, and rapidly regenerating cells, like red blood cells and immune cells, have a high need for folic acid. Folic acid is also involved in the production of neurotransmitters such as serotonin and dopamine, which regulate brain functions including mood, sleep and appetite. Cyanocobalamin (Vitamin B12) is a water-soluble vitamin needed for normal nerve cell activity, DNA replication, and production of the mood-affecting substance. It is also essential for metabolism of fats and carbohydrates, the synthesis of proteins, and manufacture and normal functioning of blood cells. Cholecalciferol (Vitamin D3) is a fat-soluble vitamin which can be obtained from food sources and is also manufactured in the skin through the action of sunlight. The most important role of vitamin D is maintaining blood levels of calcium, which it accomplishes by increasing absorption of calcium from food and reducing urinary calcium loss. These are vital for healthy functions and development of bones and teeth. Vitamin D also plays a role in immunity, normal cell growth and maturation, blood cell formation, secretion of insulin by the pancreas, and nerve impulse transmission and muscle contraction. Phylloquinone (Vitamin K1) is a fat-soluble vitamin needed for proper bone formation and blood clotting by helping the body transport calcium. It is necessary for the production of a urinary protein involved in kidney function which inhibits the formation of calcium oxalate kidney stones. Leafy green vegetables, such as spinach, kale, collards, and broccoli, are the best sources of vitamin K.
Biotin is a water-soluble B vitamin that is obtained from dietary sources as well as produced by gut bacteria. Good dietary sources of biotin include organ meats, oatmeal, egg yolk, soy, mushrooms, bananas, peanuts, and brewer’s yeast. Biotin acts as a coenzyme in the metabolism of protein, fats, and carbohydrates. It is essential for cell growth and replication through its role in the manufacture of DNA and RNA, which make up the genetic material of the cells. It is also vital for growth of healthy hair and nail. Kelp is a brown-coloured sea vegetable that is a good source of iodine which is an essential trace element for humans. Iodine is a component of the thyroid hormones that determine the metabolic rate of the body. Thyroid hormones are important for the growth and development of all organs, especially the brain, reproductive organs, nerves, bones, skin, hair, nails and teeth. L-Methionine is one of the essential amino acids (building blocks of protein), that cannot be produced by the body and must be provided by the diet. It supplies sulphur and other compounds required by the body for normal metabolism and growth. Methionine belongs to a group of compounds called lipotropics, or chemicals that help the liver process fats (lipids). Meat, fish, and dairy are all good sources of methionine. n-Acetyl-L-cysteine is a non-essential sulphur-containing amino acid. It is a component of the antioxidant, glutathione, which is useful in protecting the body against free radical damage. Cysteine can be converted into glucose and used as a source of energy. It also strengthens the protective lining of the stomach and intestines, which may help prevent damage caused by aspirin and similar drugs. In addition, cysteine may play an important role in the communication between immune system cells. In summary, Multivita is a comprehensive combination of essential vitamins, minerals and amino acid that are important for various functions in the body. These nutrients are vital for maintaining good health and general well-being, reducing the prevalence of nutrient deficiencies, decreasing the incidence of infection, and reducing anxiety and stress. Barringer T.A., Kirk J.K., Santaniello A.C., Foley K.L., Michielutte R., Effect of a multivitamin and mineral supplement on infection and quality of life. A randomized, double-blind, placebo-controlled trial, Ann Intern Med. 2003 Mar 4; 138 (5): 365-71. Bender M.M., Levy A.S., Schucker R.E., Yetley E.A., Trends in prevalence and magnitude of vitamin and mineral supplement usage and correlation with health status, J Am Diet Assoc. 1992 Sep; 92 (9): 1096-101. Carroll D., Ring C., Suter M., Willemsen G., The effects of an oral multivitamin combination with calcium, magnesium, and zinc on psychological well-being in healthy young male volunteers: a double-blind placebo-controlled trial, Psychopharmacology (Berl). 2000 Jun; 150 (2): 220-5. GNC Healthnotes: www.gnc.com McKay D.L., Perrone G., Rasmussen H., Dallal G., Hartman W., Cao G., Prior R.L., Roubenoff R., Blumberg J.B., The effects of a multivitamin/mineral supplement on micronutrient status, antioxidant capacity and cytokine production in healthy older adults consuming a fortified diet, J Am Coll Nutr. 2000 Oct; 19 (5): 613-21. Navarro M., Wood R.J., Plasma changes in micronutrients following a multivitamin and mineral supplement in healthy adults, J Am Coll Nutr. 2003 Apr; 22 (2): 124-32. Reavley N., The New Encyclopedia of Vitamins, Minerals, Supplements and Herbs, Bookman Press, Melbourne, 1998.